First of all what an amazing God lead review for me! I have always had a bit of worry in the back of my mind if homeschool was really the way God wanted me to go with my children. Getting this review just confirmed it for me. This devotional has a devotion for each day of the year. These pages are places every few pages of the bible. So this bible is a usable everyday bible as well as having a nice little pick me up page for a daily devotion to help pump you up and encourage you. Each one is marked by the month and day. The first thing on the page is a verse from the bible and then a page of a some uplifting words and stories that go along with that verse as it corresponds with homeschooling. These devotions are written by a homeschool mom of 25 years, Janet Tatman. Every morning when I got ready to start my day I pulled out the Bible and my Homeschool Planner. I read the daily devotional and the story that went with it. I then said my prayers for the day and reflect on what was said. This helped me lead in my planning, as many of things I could correspond with my teachings to my children. Since we do not school on weekends I would read the weekend devotions during the days that were a little tough for me. They always brought great encouragement to me. The book is a hardback book and it has a protective paper cover over it. The pages are thin like any other Bible as well. The fonts were very legible and the words were well written for easy understanding. There is also an index with different topics listed and the pages you can find those topics on. This is great when you have a specific thing you would like to look up or possibly need some extra encouragement on. Janet also ends each devotional with a little prayer. 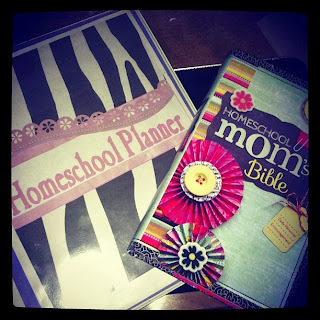 I think if you use God in your homeschooling then you will love this bible. I have also replaced my regular bible for this one as well. It is nice to be looking up scripture or doing a regular study and one of the devotions pop up in the next page. They always seem to pop up when I need them the most, even if I did not know I needed it at the time. I feel very blessed to have this as a part of my relationship with God and as a part of my homeschool.